My Harlem terrace gardening began a few days ago, when I planted a modest packet of fava beans. They are the earliest crop, and one plants them around the time crocuses open. And here in Harlem, on the slopes below Columbia University and the Cathedral of St John the Divine, the crocuses have opened. On Saturday, when I saw a nursery trolley of pansies, violas and miniature daffodils outside Best Yet, a neighbourhood supermarket, I fell for it. At least , for the violas. The price for a flat (48 plants) was about half what it is at the nurseries and plant shops I have visited in Brooklyn and elsewhere in Manhattan. And that is why I gardened on the terrace yesterday, in temperatures hovering around freezing, despite the Frenchman's admonitions about frostbite. True, when I came indoors, while my core was perfectly warm, my toes and fingers were not. But now we have spring flowers that will last till the really warm weather. I gave my roses some food, too. And sowed grass for the cat. And all that made me really happy. Can't wait to plant some Pansies in my pots, have a while before we see some here in MI. today we will reach 22 degrees and my pots are all still frozen with ice and snow on top. Lucky You!!! Today I will go out and finish cleaning up the last section of the vegetable garden and if the rain holds off plant lettuce, peas and salad greens. Let the gardening begin! 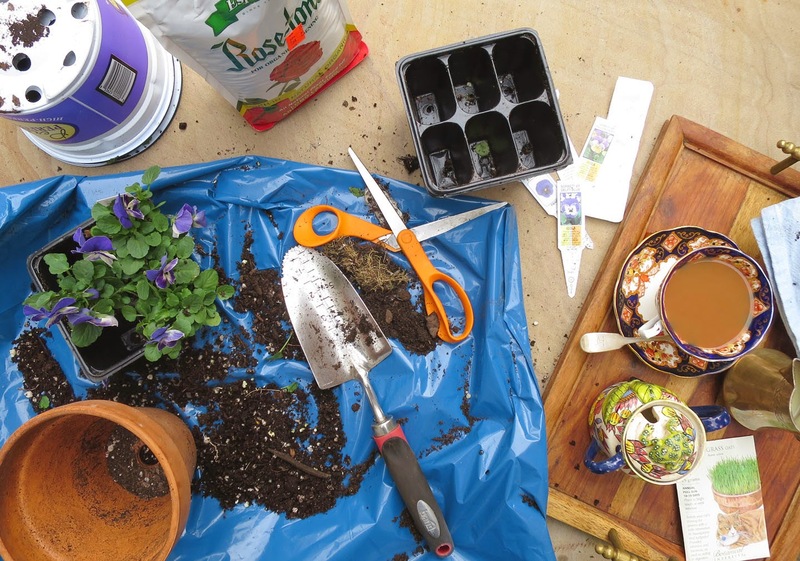 I planted pansies today too! And looked at beautiful pictures from your fabulous book! Yesterday I ordered two large planters to be delivered for free in hopes of really having a garden this year on my balcony in the city. This is my second year in an apartment and I now have the gardening bug after 20 odd non gardening bug years with a large yard! I'm pretty sure it has everything to do with your blog and gorgeous book! Actually, what I noticed immediately was the coffee in a lovely china cup. You're my kind of gardener Marie. Have you started your nicotiana yet? I sprinkled those teeny-tiny seeds on top of some soil March 2 and after days of watching and waiting they sprouted March 13. Now to decide where the best place to plant them for my nose will be. Because of the noise situation when our landlord is in residence, we can't stay. That's too bad. Moving is not fun. Maybe you can find a place with a terrace AND more light inside.